Welcome to In Other Words Translation. We have experience working with customers in a range of industries. Our clients include commercial bakeries, pet products manufacturers, real estate management companies and non-profit organizations. We have the experience to fit your company’s needs. We are able to quickly and expertly complete your translation job to the highest standards. 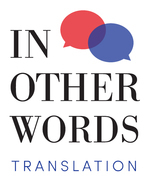 We deliver highly accurate and readable finished translations. We can translate most documents including general correspondence, product literature, birth certificates, brochures, specifications, and manuals. We also understand the importance of security and confidentiality. With In Other Words Translation, you can be assured that confidentiality is guaranteed with every job.